In 1855, Parker County was created by the Texas State Legislature and named for pioneer and State Representative Isaac Parker. Parker was the uncle of legendary Cynthia Ann Parker, a little girl who was stolen from her home by Indians during the Texas Revolution. Cynthia Ann grew up among the Comanche and become the mother of the great Chief, Quanah Parker. Years later, when she was overtaken in flight with an Indian raiding party, it was Isaac Parker who recognized her as his long lost niece. The Town of Weatherford was named for the State Senator of this district, Jefferson Weatherford of Dallas. According to his cousin, Senator Weatherford never set foot in the town that bears his name. The first settlers had arrived less than ten years earlier, but soon came by the hundreds. Many other pioneers stopped here on their way across the wilderness traveling the only major road leading west. They had to brave many Indian attacks between the years of 1846 and 1874. You can find several headstones in Parker County that read, "Killed by Indians." The railroad arrived in June of 1880 with great fanfare. The Santa Fe Depot (that today houses the Weatherford Chamber of Commerce) was built in 1908 under the Jim Crow laws. The waiting rooms were segregated and separated by the ticket office. The brick loading platform remains intact and the building is well preserved. In 1895, the town's newspaper, the Weatherford Democrat, began and today continues to inform the residents of the town's goings-on. Parker County's first courthouse was built of rough pine lumber in 1856. It was replaced with a brick one in 1858. It was destroyed by fire in 1874, and the loss of county records caused great inconveniences for years to come. In 1878, the cornerstone was laid for a stone structure that too was burned down in a suspected arson. The fourth and present courthouse (pictured) was completed in 1886 at a cost of $55,555.55! The Seth Thomas Clock was installed in 1897 for $957. 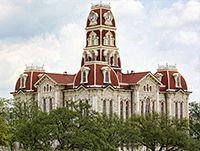 The Courthouse has recently been restored on the inside to bring back its classic beauty and original splendor from the turn of the century. Weatherford has a rich western heritage filled with colorful characters. Legendary cattle drover Oliver Loving is buried here in Weatherford's Greenwood Cemetery. After being attacked by Indians in New Mexico in 1867, Loving's dying wish to his friend, Charles Goodnight, was to be buried in his home, Parker County. Goodnight brought the body back 600 miles by wagon for burial. If this story sounds familiar, it should. It is the inspiration behind Texas author Larry McMurtry's novel, Lonesome Dove. A year earlier, Charles Goodnight had invented the first "chuck wagon" which catered "fixings" for the cowboys on a cattle drive that would later become known as the Goodnight-Loving Trail. Boze Ikard, who served with Goodnight and for whom the character "Deets" was modeled, was also laid to rest in the Greenwood Cemetery. 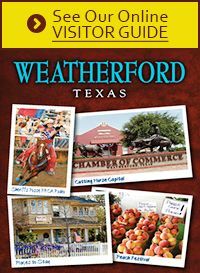 Now known as the Cutting Horse Capital of the World, Weatherford, Texas is home to hundreds of professional trainers, Hall-of-Fame horses and a breathtaking, life-size bronze cutting horse. "Cutters" from all over the country, send their horses here for training or breeding to the best studs in the industry. Several National Cutting Horse Association affiliates hold local competitions on a regular basis. One of Weatherford's greatest attractions for the cutters in the native "sandy loam" soil that is cushioning for a horse's feet. Named by the State Legislature as the Peach Capital of Texas, Weatherford and Parker County growers produce the biggest, sweetest, juiciest peaches around. The Peach is celebrated each year at the Parker County Peach Festival, Weatherford's largest event and one of the best-attended festivals in Texas. 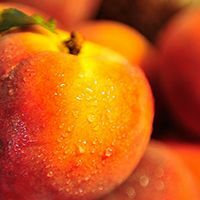 More than 35,000 visitors come to Weatherford to enjoy homemade peach ice cream, peach cobbler, peach pie, peach juleps, peach smoothies, and just plain juicy peaches! Be sure and visit the Farmers Market for peaches and other delicious Parker County produce, including watermelons and pecans. Click here for information on the next Parker County Peach Festival. Perhaps Weatherford's greatest treasure is the abundance of historic homes and buildings. More than 60 Queen Anne, Victorian and other architecturally significant homes built at the turn of the century sit along the tree-lined avenues where horse-drawn carriages once carried the pillars of the community. The crown jewel is the breathtaking Parker County Courthouse. Located in the geographical center of the County, this Second Empire style courthouse is the heart of downtown and the entire community. Visit the historic shops around the downtown area and you will find that they served other purposes at the turn of the century – some of them were saloons and "cat-houses!" Each year at Christmas-time, the Parker County Heritage Society arranges a Candlelight Tour of Homes that give attendees a rare opportunity to see the inside of many restored homes. Weatherford is also the birthplace and was the home of Mary Martin, internationally known Broadway star, renowned for her portrayal of the beloved Peter Pan. Her son, Larry Hagman, became a famous TV star, forever immortalized as the villainous J.R. Ewing of the television melodrama, Dallas.Larry Hagman was just as fond of Weatherford as his mother was, and he made appearances for special occasions and to help many Weatherford charities until his passing in Novemeber of 2012. Former U.S. Speaker of the House Jim Wright grew up in Weatherford and even wrote a book about his youth, "Weatherford Days... a Time of Learning." Famed portrait artist Douglas Chandor moved to Weatherford to be with the love of his life, Weatherford native, Ina Kuteman. Known internationally for his portraits of the rich and famous including Queen Elizabeth, Winston Churchill and President Franklin D. Roosevelt, Chandor created another masterpiece in Weatherford, his magnificent Chandor Gardens that are now open to the public.